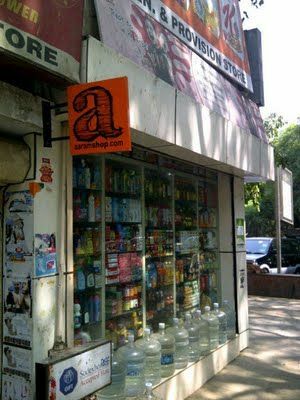 New-Delhi based start-up Aaramshop.com has launched an e-commerce site for buying groceries. Still in beta, the website only caters to New Delhi residents and yet to be commercially launched. Daily essentials such as laundry supplies, cereals, butter, jam, rice, atta (flour), lentils, cooking oil, biscuits, chocolates, sweets, milk, spices, coffee and tea are available on the website. The website allows you to search for the nearest neighbourhood local grocery stores - either by name, by pin codes, location, maps or view all the 'Aaramshops' available and select one. Once this shop is selected, delivery timings can be chosen. Once the user selects the items needed, adds them to the shopping bag and checks out, a confirmation e-mail and text message is sent with the amount and time of delivery. There is no online bank transaction involved and the user has to pay cash on delivery of goods by the shop. The primary advantage of Aaramshop, according to Vijay Singh, CEO & Managing Director, Aaramshop, is convenience. Aaramshop.com targets a very niche population. Singh says, "We are looking at tech-savvy, small families with extremely hectic lifestyles, who do not want to waste the weekend shopping for household necessities." Aaramshop was founded in April 2011 by Vijay Singh, a serial entrepreneur who sold his previous start-up Sercon to ad conglomerate WPP's 141Worldwide. Singh is the sole promoter and established it with a team of five and has since added four technology experts. "We started off wanting to build a company around FMCG. But instead of just advertising or marketing, we wanted to focus on closing-the-transaction level. The digital spend by any FMCG company today is miniscule; they look at it as more of a gimmick. And 95 per cent sales happen through traditional retail outlets so they are the best logistical points. We thought - if we get the order to this guy, they can handle the last mile. We look at ourselves as a bridge between brands, retailers and the consumer," says Singh. Singh decided to attempt a hybrid model that would incorporate both offline and online pieces with Aaramshop. A pure online play will not be successful in India, according to him. "I dont believe that groceries will work only online. It needs offline too. We are not getting into supply chain," he said. To begin with, Aaramshop.com will sell ad space and next will offer targeted advertising on different pages for FMCG brands, based on the categories of products they offer. But the company has also patented a new revenue model called 'Click To Bag', on the lines of Google's sponsored search results. Currently products are showcased on the basis of highest sales volumes. With Click to Bag, FMCG brands will be able to push their products up and attract customers on Aaramshop.com. This will rake in revenues in the future for the website, depending upon the size of audience it reaches. 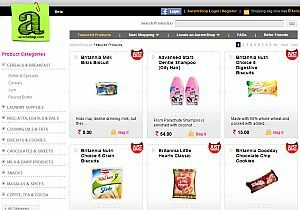 Aaramshop has 30 FMCG brands on board, who are sharing information on promotional activities with the site. Next, the company will allow them to directly upload and list their promotions using a self-service platform at Brandengagementcentre.com, to be launched in the next 15 days. The platform will also use analytics of the website to deliver reports and trend information to the brands. Aaramshop has started trials with 40 neighbourhood stores and has signed on 200 in all. It has outsourced offline marketing to smaller activation firms in different geographies who meet and explain the concept to retailers. The advantage for local shop owners is additional income and an online presence. "Currently, around 50 percent of their business is done on the phone. We are offering another medium for sales using the Internet. We can also expect order sizes to be higher as buyers are able to consume more information online and can select more items," he says. In terms of online presence, it will be the first time that details of local shop owners will be available online - address, areas serviced, number, timings, contact number, photos of the shop and delivery radius. This will boost discovery of such shops. Shop owners do not pay to become part of Aaramshop's network. "We have created an open network - we do not charge them commissions for leads nor for transactions because we want as many traditional retailers as possible to come on board," he said. Aaramshop is not going to offer groceries cheaper. "We are not a discount platform. But because there are a number of retailers who are coming on the platform, there will be a discount that they will pass onto the consumers." There are still some chinks to be worked out. For example, an online order cancellation policy has not been implemented on Aaramshops and users will have to call up the retailers directly to cancel their order. Once the company is through with trials, it will launch in Bangalore, Chennai, Hyderabad and Mumbai and by year end, plans to have a presence in top 10 metros. There are more products coming up, such as mobile apps which will allow people to order groceries even while on the move. Aaramshop is also trying to leverage Facebook and build stores within it so users can shop directly on the social network without having to leave it. Brand e-commerce widgets are also in the works. These widgets can be placed on other FMCG websites which will redirect to Aaramshop.com. On why FMCG majors have not offered online shopping yet, Singh says, "If people try to control the supply chain, it will take forever. Kirana shops have been around for decades and service the markets very well. People sitting in these shops are owners and entrepreneurs and are more adept at grabbing opportunities." Some sites offering grocery shopping in India include ChennaiOnlineGrocery.com, which only serves Chennai region and Infibeam's Grocery Section which delivers across India but has limited categories - coffee, cookies, food supplements, food and beverages and tea.